∼ 2010 ∼ December ∼ 22 ∼ Dance Star Mickey!!!
! ($74.99) Leo loved it!!! He was hugging Mickey, dancing with him, kissing him! Then he accidentally pushed him over. I picked Mickey up and get this…. Mickey said “Thank You”! 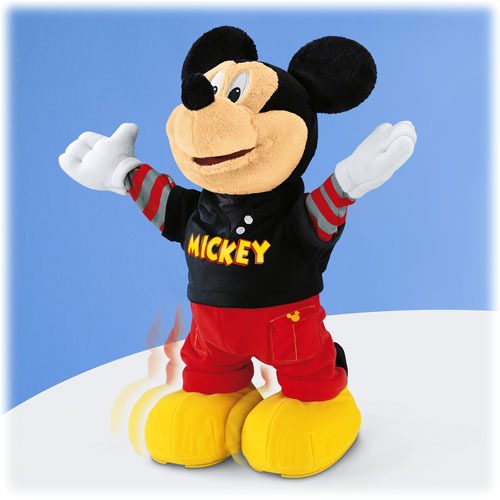 Mickey dances, claps, moonwalks, talks and encourages your little cutie to boogie down! I have to say that this Mickey is pretty cool… and pretty creepy at the same time. I wouldn’t want to be left alone in a room with it, but it isn’t at my house, so it’s fine. So, if you have little ones and want to spoil them with a really awesome toy, run to your local Toys R Us or click the box below to order from Amazon and pick up Dance Star Mickey! Hours of fun!!! OMG OBSESSED!